The opening ceremony of Charumati, a Dance Drama was held at the Theatre Village in Kathmandu on Saturday, March 01, 2014. Rt’ Honorable President of Nepal, His Excellency Dr. Ram Baran Yadav and Ambassador of India to Nepal Shri Ranjit Rae jointly inaugurated Charumati: a Dance Drama written by veteran cultural historian and playright of Nepal Satya Mohan Joshi and directed and designed by Bimal Subedi, artistic director of the Theatre Village. 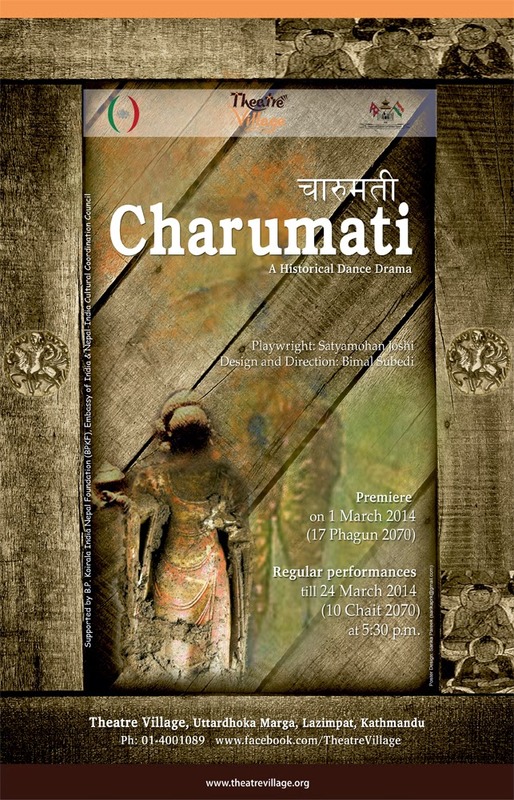 The dance drama – Charumati depicts the story of Charumati, daughter of emperor Ashoka. Charumati is believed to have come to Nepal with Emperor Ashoka and married Devapala of Patan. After marriage she settled down in Nepal. She is credited with building a Buddhist stupa at Chabahil which is now known as Dhando chaitya or Charumati stupa. The dance-drama begins with invocation to Nriteshwor, the god of dance and drama. A gachhi, a sacred curtain with printed Nriteshwor on it, is brought to the stage which is followed by devoted dancers who pay tribute to the God Nriteshwor. They perform ritualistic dance followed by a song composed in classical Newari language. It is sung in Rag Malava and Tal Jati. What unfolds further is Charumati’s visit from Patliputra to Nepal and her stay here. Eminent actors of Nepal Keki Adhikary and Bhola Sapkota enacted brilliantly to bring the chapters of Charumati’s life alive on stage. The dance drama was jointly organized by the Embassy of India in Kathmandu, B.P. Koirala India-Nepal Foundation, The Theatre Village and Nepal-India Cultural Coordination Council. The opening ceremony of the dance drama had selected invitees including high level political dignitaries, officials from the Government of Nepal, diplomats from various diplomatic missions based in Nepal, corporate leaders, people from the expatriate community, artists from Nepal as well as friends from the media. From the Press Release made by Embassy of India, Kathmandu, Nepal.